On a trip southward through Indiana I picked up these three postcards at an antique store. All three deal with men in the US Army either right before our entry into World War 2 or during. I selected them over others because they have writing on the back and were clearly sent to friends or loved ones. This one is post-marked September 17, 1942, about nine months after the US entered the war. The sender is Pvt. Charles Vanausdall who is part of a HQ detachment at Fort Belvoir. Fort Belvoir was a training center for Army engineers during the war and Charles identifies himself as an E.T.-engineer trainee. I found a link on Ancestry that indicated Charles’ status as a veteran (name and dates match) and burial but didn’t want to sign up for Ancestry and pursue where the grave might be. 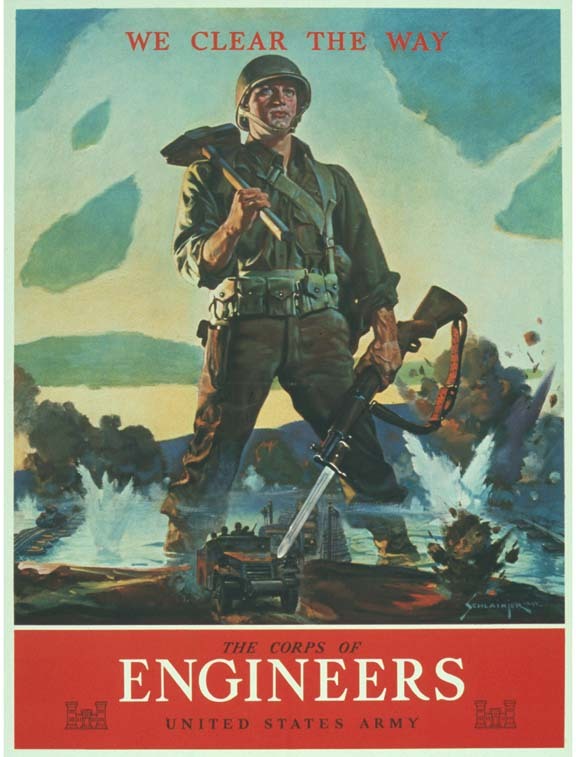 My understanding of Army Engineers during WW2 is that they were of two types. The first types were “combat engineers” that accompanied the infantry and armor to help with the nasty work of over coming obstacles and fixed defenses. My wife’s uncle was a combat engineer and he was killed outside the Siegfried Line in September, 1944. The other type of engineer was more the builder than the destroyer and they would be the ones to erect bridges, build air fields, put down roads and other massive projects that would keep the Army on the move. This is pure speculation on my part but given the date and the location of the fort it is possible that Charles was being trained for Operation Torch, the Allied invasion of North Africa in November of 1942. 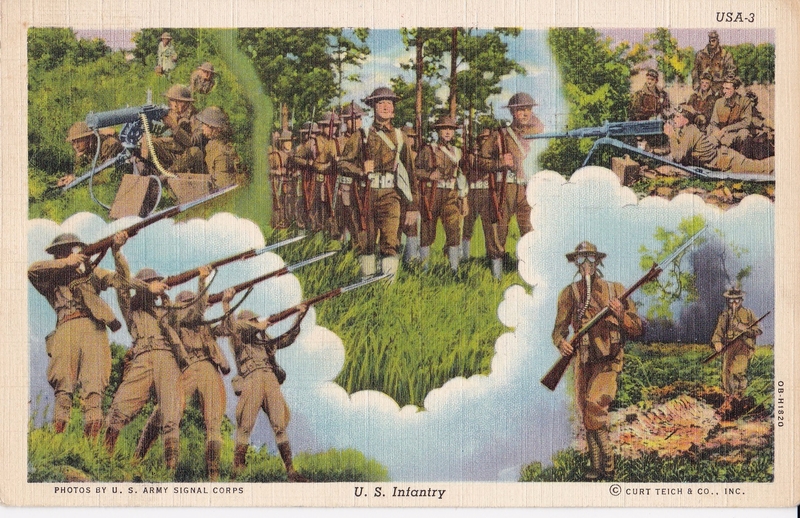 The second card is interesting and colorfully shows the training of US Infantry. 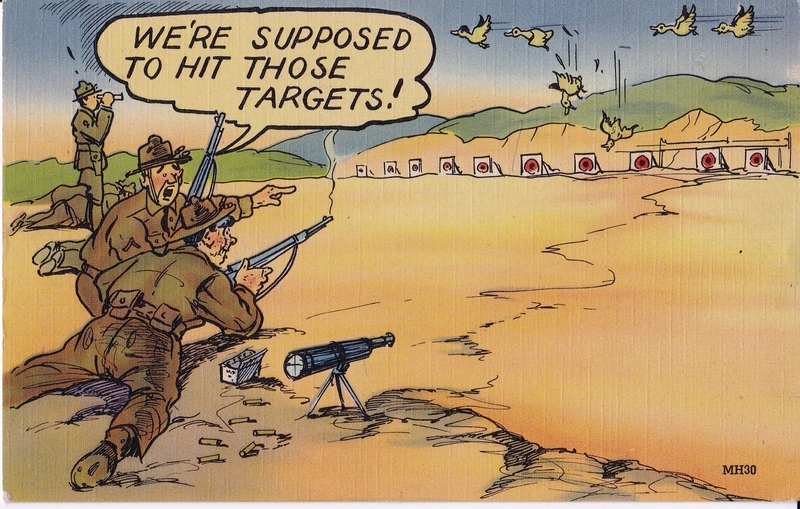 The card is post-marked pre-war, April 3rd, 1941-a time when the US was clearly gearing up for the war in Europe that had been raging since September, 1939. The soldiers on the card could pass for the WW1 variety with the old style steel helmets, gas masks, Springfield Rifles and campaign hats. The sender in this case appears to be a man named Jan and he’s writing to a Mrs. Mae Hawes of Barton City, Michigan. He addresses Mae as “Dear Friend” and since she is married it is likely that Mae is indeed just a friend. I’m speculating that Jan was drafted and sent to Camp Grant as a way station before going somewhere else for training. According to Wiki, Camp Grant was an induction center but many men did undergo basic training there. Wiki further notes that about 100,000 men were trained as medics at the camp. The camp was also used for the detention of 2,500 POWs. The card is simply signed Jan with no last name on the card. There were a number of this type of card at the antique store but I selected this one because it was filled out and had writing on the back. This type of card was meant to save the soldier some time. 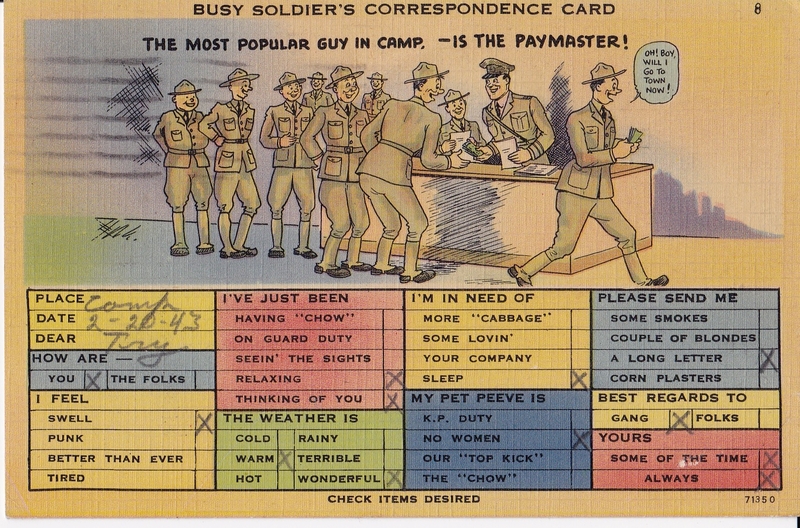 The soldier simply checked off small talk boxes and wrote something more personal on the back. It was a shorthand letter that fit on a post card. The date is 2-20-43 and the place it was sent from appears to be Compton(?) Mississippi. The recipient is “Tory Shielda” who lives in Tampa, Florida. The sender is Sgt. Elbert E. Jones who is in the 116th Field Artillery. Today the 116th Field Artillery is part of the Florida National Guard so one can assume that Elbert was part of that organization when it was called up for Federal service during the war. Elbert indicates on the face of the card that he feels swell, is relaxing, thinking of Tory, that he needs sleep and that he has the pet peeve that there are no women around! He asks for a long letter from Tory, sends his regards to the folks and says he is “hers” some of the time and always. Tory is clearly Elbert’s love interest. On the back he writes, “a line to say I’m mad at you and haven’t had a letter or card for a long time. Hope this finds you enjoying the best of all and write soon to Jonesy. One of the biggest fears a soldier had (has) was to receive a “Dear John” letter. A “Dr. John” letter was a breaking off of the relationship and the realization to the soldier that his girl was not waiting for him to come home. The first sign that a soldier might receive the “Dr. John” letter was the absence of communication from his sweet heart for a long period of time. I suspect Elbert is worried that Tory has found another and he is looking for reassurance that is not the case. During my short time in the Army (1971-72) soldiers were still getting “Dear Johns.” We actually sang a song about it indirectly. As I recall, the girls we left behind were cavorting with a fictional character by the name of “Jodie” another male who did not get drafted or enlist. As the song went, when the soldier got home, he’d pay a visit to “Jodie” and bust his head. Crude to be sure but it reflected the anguish of getting a “Dr. John” from the girl who promised to wait for you. I often wonder how these personal type correspondence end up at rummage sales or antique stores.The speak of relationships and of war and one wonders what happened to the sender and the receiver. Perhaps a relative will one day run a search for their long-lost relative and find the link to my blog. I’d be happy to reunite them with their loved one with the card. Great post, but then again, you KNEW I’d love it!! Fascinating pieces of history, many thanks for sharing these treasures with us. I think it’s fantastic that you were able to pick them up. A few months ago I was sickened to see an article about someone finding bags of trash and mixed in with the trash were some rare genealogical finds in the form of old German passport (pre-WWII?) and family photos. Thanks for stopping by JG. I know what you mean. Also, think about how rare written correspondence will be in 20 years. Everything is electronic, letters, post cards, getting cards, and text messages.